I learned how to make potato soup at a very early age. It was a staple in our home throughout the winter months. Mom always said if she had potatoes in the house she could make a meal and she proved that often. In the cold winter she would mix up a delicious pot of hot soup for lunch; it was so good. The way I learned how to make potato soup was pretty simple and basic. To make this simple potato recipe, Mom taught me to boil the potatoes in only enough water to cover the potatoes until very tender. The starch from the potatoes remained in the water. After the potatoes cooked, I would only add butter, milk, salt and pepper. It was so good. Back then I had a friend who learned how to make potato soup from her mother and she always made it with tomato juice and not milk. My first thought was “how awful” but when I tasted it I found it to be very good. As the years passed, I began adding more ingredients to add more flavors. Now I teach people how to make potato soup by adding some of their favorite seasonings and spices. Most of the time now I will add finely chopped onion and celery. Many people I have known make a flour rue to thicken their soup; some use bread crumbs or even instant potato flakes to thicken. Like my young friend many choose to add tomatoes in some form, a variety of vegetables and cheeses. Potatoes are also a staple crop in many other countries besides here in the United States. All of Europe and South America depend on potatoes as much as we do here. Ecuador is a country of coastal areas and much of it is at very high altitudes. As with many foods, the recipes vary from each area. Below is a recipe from the highlands of Ecuador; the basic difference is that the highlands season with sweet paprika and the coastal area uses annatto. 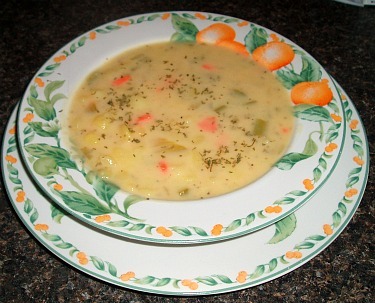 Learn how to make potato soup with my easy creamy recipe. Sauté onion in butter until tender not brown in a medium saucepan. Add potatoes, carrot and parsley; add enough water to cover mixture. Simmer mixture until potatoes are soft; crush potatoes slightly with hand masher. Add cream; cook until hot but NOT BOILING. Season with salt and pepper to taste; serve immediately. OPTIONAL: add more butter if desired. Drain potatoes when soft. Add ¼ Cup milk and beat thoroughly. Season to taste. Work 1 tablespoon butter into flour then add the beaten egg. Thoroughly mix flour and egg mixture into the potatoes. Heat 1 quart milk and 1 tablespoon butter to boiling point. Drop potato mixture by spoonfuls into hot milk mixture. Season to taste and serve. When I was young, my good friend always made potato and tomato soup when we were out of school. When I first saw her open a can of tomatoes and put into the pot with potatoes I thought that was so strange. She said wait until you taste it! I was amazed what good flavor it had. Try it sometime! In a medium size pot cook potatoes and onions in boiling water until tender. In a small bowl use 1/3 Cup of the milk with the flour to make a thickening. Add salt, bay leaf, pepper, celery, tomatoes, butter and remaining milk to the soup pot. Stir in the thickening mixture and simmer for 30 minutes. Learn how to make potato soup with this recipe for a thick hearty "stew" from the mountainous region of the Ecuador cuisine. Melt butter in a large heavy saucepan; stir in paprika. Add onion and sauté until onion is tender; pour in 8 cups of water and bring to a boil. Add potatoes and simmer over low heat uncovered stirring occasionally. When potatoes are almost done add cream. Continue to cook stirring occasionally until potatoes start to fall apart. Stir in the cheese and season with salt and pepper; serve immediately. A plate of avocado slices is usually served with the soup. In saucepan cover potatoes with water and cook until barely tender. Cook bacon in large skillet until crisp; drain, crumble and place in a large pot. Add onion to skillet with 2 tablespoons of the bacon fat; cook until golden brown. Add bacon, beef, ham hock, water and salt to large pot; cover and simmer 1 ½ hours. Remove beef from shank and ham from the hock; discard bones. Dice meat and return to the pot; add undrained potatoes, beans and garlic to pot. Cover pot and simmer for 45; add sausage, bacon and pepperoni. Simmer another 15 minutes; serve hot bowls of soup with bread and salad for a full meal. Combine in large pot potatoes, celery, onion, carrots, bouillon and butter. Add enough water just to cover vegetables. Using a hand potato masher, mash potatoes to small pieces. Stir in milk, cream, Worcestershire sauce, 1 cup bacon pieces, parsley, black pepper, garlic salt and Greek seasoning. Mix well and heat until steaming (do not boil); stir in an instant mashed potato flakes a little at a time. NOTE: As the potato flakes cook the soup will become thick so be careful not to add too much. Garnish individual bowls with cheese, green onion and bacon pieces.